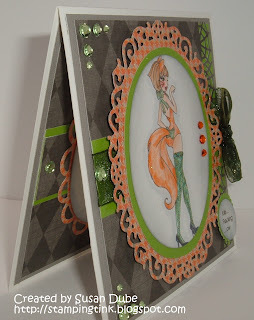 Stamping Tink: Miss Kitty for Fabulous Friday Freebie for Sassy Studio Designs! Miss Kitty for Fabulous Friday Freebie for Sassy Studio Designs! Halloween is such a fun time of the year. You get to dress up and be anything you want to be. It's the one time of the year you can be that person or take on that personality that really lives deep within you. Over at Sassy Studio Design, we love us some Halloween! Make sure you stop by the blog and catch the teasers for the new release we are going to be presenting in a 2 day blog hop tomorrow and Sunday! Believe me, you won't want to miss them. They're going to be spooktacular! Today I've got a little bit of Halloween to share with you for our Fabulous Friday Freebie over at our Paper Craft Planet group! Today's freebie is Miss Kitty and she is just purrfect! She's so sassy! She has attitude like you wouldn't believe, doesn't she? She reminds me of my cat, Porthos. Even though he was a male, he absolutely had that way about him that let you know he was his own man and had his own mind! Gosh, I loved that cat! He was a cream colored Persian and had this long, bushy tail that went on forever! This babe reminds me of my sweetie. He got mad at me when we moved and the first chance he had to get out, he took off and broke my heart. I still miss that cat to this day and it's been over five years. But I know he's found someone to take care of him so as long as he's happy, I can bear to be without him. I colored this independent gal with copics and Spectrum Noir markers, used Stickles all over her, added some Diamond Glaze to her hot lips and some distressed around the edges. The dies are from Spellvinders and the gems are from Studio 112. 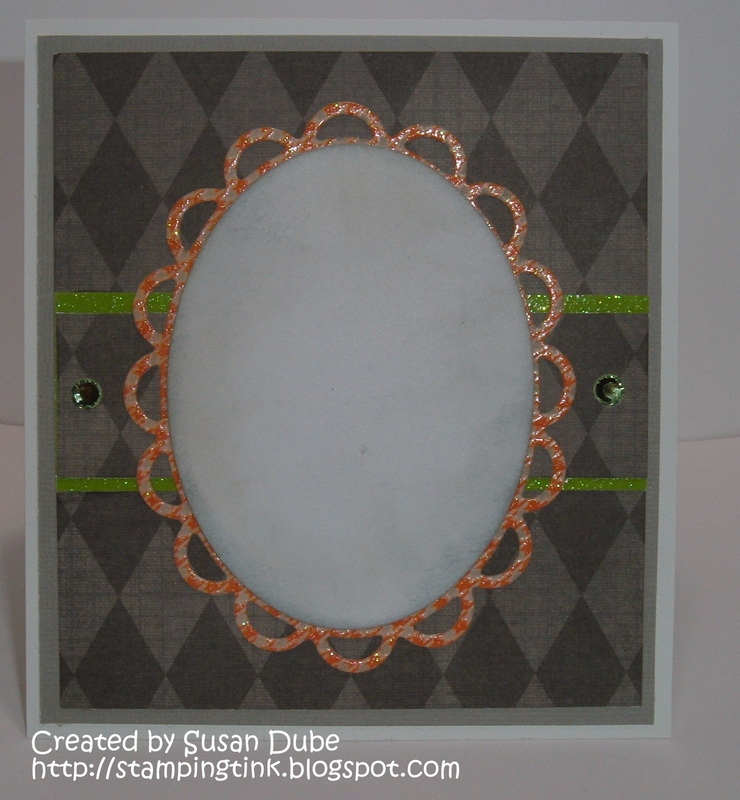 I used my Martha Stewart spider web edger on the sides and the papers are from the Bewitched paper pad from DCWV. Here's views of the side and here she is up close. Can't you just hear her purr? Judy, you need to hurry back and catch up on the insides of my cards because I'm about to change them up on you! Tell me all about Halloween - do you love it or are indifferent about it? 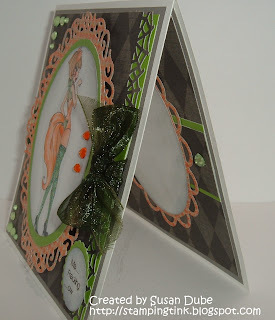 Make sure to stop over at the Sassy Studio Design group at Paper Craft Planet and pick up this freebie. She's only available for 24 hours so don't miss out on her! Also, we're getting close to 800 members over there. When we go over that magic number, Lindsay has a special something for everyone so hurry over and join! Believe me, you won't want to miss it! Have a great weekend and I'll be back with something new for you! What a fun design! Love what you did with her, too... those Sassy Studio images are such fun to work with. Love all the sparkles and rhinestones. My fingers were going to type shinestones - maybe that is what we should call them as they are shiney. I'm sorry about your cat. Beautiful! LOVE all the glitter! Susan, fabulous card! Love, love, love all the sparkle. Love your card Susan, especially loving the glitter. Gorgeous Card. Love the papers you used. The color combo is just perfect and so is your coloring. I really like how you decorated the inside of your card too. Perfect. Have an awesome weekend my friend. Don't know how I missed that one, but MEOW she's gorgeous. Love it. Miss Kitty looks meow-velous in her sparkly glory here! Gorgeous die cut and love the spider web border too! Pretty Pumpkin for Scrappy Frog Challenge!